3 x Large Metal Iron Flower Pot (other accessories are not included). Note: According to reviews from our customers, from 14th Feb 2016, we have improved these iron planters by adding four small holes at the buttom for leaking water. According to reviews from our customers, from 14th Feb 2016, we have improved these iron planters by adding hole at the buttom for leaking water. Too much water within planter may drown plants, rotting the rhizome. 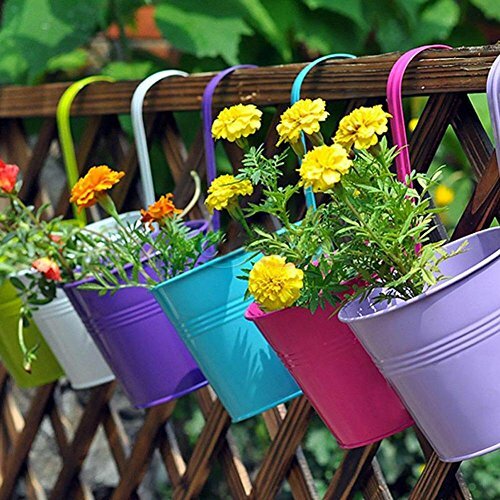 These special flower pots can be hung on the balcony, window, railing, anywhere in the room to decorate them. With detachable hook, which also can be used as desktop storage barrels, pen holder and other purposes.Bring your house rural countryside atmosphere. It can be used with dried flowers, silk flowers, and small potted plants outside so do matching decorative pots. If you have any questions about this product by LOVOUS, contact us by completing and submitting the form below. If you are looking for a specif part number, please include it with your message.